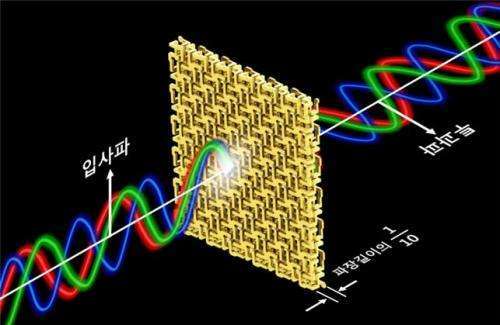 A research team in South Korea has developed a technology that can manipulate a polarized light in broadband operation with the use of a metamaterial. Professor Bumki Min from the Department of Mechanical Engineering at Korea Advanced Institute of Science and Technology (KAIST) has led the research and it is expected that this technology will lead to a development of broadband optical devices that can be applied to broadband communication and display. When an object or its structure is analyzed by using a polarized light such as a laser, the results are generally affected by the polarization state of the light. Therefore, in an optics laboratory, the light is polarized with various methods. In such cases, wave plates or photoactive materials are usually implemented. However, the performance of these devices are vastly dependent on the wavelength, and so they are not suitable to be used as a polarizer especially in broadband. There were many attempts to make artificial materials that are very photoactive by using matematerials which have a strong resonance. Nonetheless, because the materials had an unavoidable dispersion in the resonance frequency, they were not adequate for a broadband operation. Professor Min's research team arranged and connected helical metamaterials that are smaller than the wavelength of a light. They theoretically and experimentally verified that a polarized light can be constantly rotated regardless of the wavelength by super thin materials that has thickness less than one-tenth of the wavelength of the light. The experiment to confirm the theory was done in the microwave band. Broadband polarized rotational 3D metamaterials were found to be rotating the polarized microwave within the range of 0.1 GHz to 40GHz by 45 degrees regardless of its frequency. Such nondispersive property is quite unnatural because it is difficult to find a material that does not change in a wide band. Along with this, the research team materialized the broadband nondispersive polarized rotational property by designing the metamaterial in a way that it has chirality, which determines the number of rotation proportional to the wavelength. Professor Min said, "As the technology is able to manipulate ultrathin polarization of light in broadband, it will lead to the creation of ultra-shallow broadband optical devices." The research findings were published online in the November 17th issue of Nature Communications.